← Tattoo Freeze Draw – and, yes, its CCR v BLITZ! This week, 3 members of CCR are jetting across the pond to Toronto, to take part in the first ever Roller Derby World Cup. Hustle’Her, who is proud to be wearing red and white is skating in the Team England squad, while Barry Fight is donning the same for his Team England Assistant Coaching position. Major Travis T is wearing his usual black and white stripes to join the tournament’s international referee crew. Why did you apply to be involved in the World Cup? Can you tell us a bit about the process? MTT: It was a unique opportunity that was too good to pass up. I had to submit an application with references. I obtained one from UKRDA as representatives of UK Roller Derby, one from Ballistic Whistle from LRG and one from Miss Trial from New York Shock Exchange who I had met 2 years ago at Roll Britannia and stayed in touch with since. Then I had to submit a ‘ref cv.’ After every bout I was involved in I’d write down the details and what position I’d been in. It was a really useful document to have and I recommend all refs do it. H’H: Who wouldn’t want to play in the Roller Derby world cup? BF: I’ve never had the opportunity to represent my country before. I had to gain references for my application. One from your own league and one from an unaffiliated league (kindly provided by Dolly Rockit Rollers in my case) and UKRDA chose the coaches based on those. How do you feel about being CCR’s representatives? H’H: Happy and sad. Of course I was happy to represent the country after months of hard work but sad my CCR teamies aren’t there on track with me. MTT: I’m very proud to representing CCR. How has CCR and its members been supporting you and the TE squad? H’H: CCR ran a cake sale after our Sioux Falls bout, matched the amount raised from the cake sale and donated the total to the Team England Squad. Everyone is really supportive, some of my team mates are coming to Toronto to watch and I know everyone else will be watching online. MTT: Centrally no money is raised for referees to attend, and no money from the Team England pot goes to refs. CCR made a contribution to my travel costs, which was very generous of them. How did you feel when you first heard you were definitely going to Toronto? MTT: Brilliant! I got en email from RAWK and Riot [Eric RAWK and Reverend Riot, the tournament’s head refs] but we weren’t allowed to tell anyone until it had been officially announced so I had to keep it from the league. I have a top secret schedule now and know what I’m doing in the Thursday and Friday seeded games. H’H: I was shocked and excited. I’d ended up leaving the final trials in an ambulance so I was in A&E when I received the email. I was shocked, but this was mixed in with the morphine from my hospital visit! BF: I found out in January, UKRDA sent the coaches references through to Blood and Thunder. I’m not sure how it was done in other countries but think we as a country should be involved in selecting the coaching squad so left it up to UKRDA. What sort of preparations have you been doing? BF: Press ups – I do them in the park. I’ve been running in cold conditions in vest and shorts so I get used to what the weather might be like in Canada! H’H: Cycling and playing derby. Researching players, plays and bonding with the team. MTT: Just what I normally do, read the rules and keep on top of my skills at training with CCR. What do you think about the teams England has been drawn against? How do you think England will fare in the competition? What do you hope to gain from/achieve during the World Cup? H’H: Being in Team England is an achievement in itself and I just want to play my best. The process is going to strengthen relations with skaters from other teams. BF: And the roller derby community this side of the pond – it’s upping the standard of the game over here. I want TE to be in the top three, second ideally. MTT: I hope to contribute to the smooth running of the games with minimum disruption. It’s good to gain access on another level of derby. 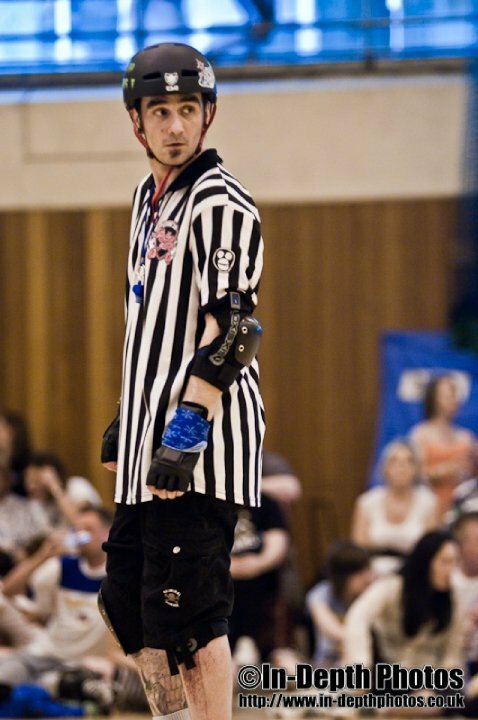 I’ve ref’d games for UK women, UK men, US men and now I’m getting a chance to ref some of the world’s best derby players – whatever I can take from that will be grand. And finally, do you think the World Cup is the start of a new legacy? What role do you think it will play in Derby? H’H: The plan is for it to take place every two years as far as I know, but it would depend on the success of this world cup. Personally I hope it continues, when else would you ever get to pay Team USA, or New Zealand, or all the other countries that are represented! It’s already improved the standard within the country I think, bringing healthy competition between skaters. BF: I think the focus will remain on Nationals but the world cup continues to unite derby fans. Everyone will all be watching the same game and a lot of bridges have been built from it already. MTT: It’s a good start to getting the sport even more recognized around the globe, putting derby firmly on the map. As rollergirls, coaches, refs and fans from all over the world make their way to Toronto this week, we wish our representatives the best of luck and stay glued to our laptops to see the games begin!